People who want to cook on vacation tend to opt for a rental house over a resort. 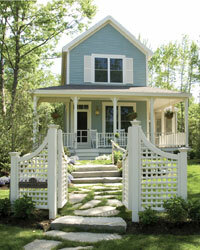 But Maine’s gorgeous Hidden Pond offers the best of both, with one extra: a garden at guests’ disposal 24-7. Many Maine rental cottages define the word “kitchen” loosely: a space outfitted with a defunct popcorn popper, a single corroded pot and knives so dull you’d be better off slicing your rib eye with a bookmark. I don’t find cooking in a space like that relaxing, which is a pity, because when my husband and I go on vacation, we actually like to cook. When we’re in a remote spot where “fresh produce” means a rubbery head of broccoli purchased at a gas-station mini-mart, the relaxation potential of cooking disappears almost completely. Some deity must have heard our vacation prayers and answered them with Hidden Pond, a year-old resort in the swanky-yet-still-adorable seaside village of Kennebunkport. The resort is made up of 14 colorfully clapboarded two-bedroom cottages on 60 acres of balsam and birch trees. These aren’t the knotty-pine cabins of my vacation nightmares: They’re beautiful, comfortable spaces, created by local designers as playful tributes to Maine style. So in addition to the requisite amenities (like Italian sheets), there are pieces from local design stores—a dramatic acacia dining table lit by a beehive-shaped bamboo chandelier—as well as quirky touches. In one cabin, a moose head carved from basswood hangs above a fireplace; in another, a rug is made from hundreds of bright-red, maple-leaf-shaped felt pieces, simulating a forest floor in autumn. And then there are the kitchens, with big dining tables, open shelves displaying an impressive selection of new and vintage serving pieces, and a full array of good equipment, like Sabatier knives. The Hidden Pond staff will stock the pantry with groceries, including Maine-made items like Carpe Diem coffee and Stonewall Kitchen vinegar. Daily maid service keeps the space immaculate. 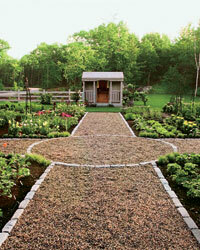 But for people who like to cook, what makes Hidden Pond especially exciting is the 800-square-foot organic garden. Guests have unlimited access to it and can pick whatever they want for free—strolling through the bentwood trellis at the entrance, grabbing a pair of shears and a reed basket from the rustic farm shed and cutting anything they desire, including flowers. A farm stand of prepicked produce is available too, and a caterer is on-call to give lessons to wannabe chefs or guests befuddled by garden ingredients like shiso and lemon balm. Thanks to the efforts of the resident horticulturist, who “pushes” plants in a greenhouse before transferring them to the ground, Hidden Pond’s garden produces vegetables as early in the year as June. That month brings Swiss chard, herbs, baby lettuces and more. In July there’s produce like baby onions, fennel, carrots and sugar snap peas. Heirloom tomatoes and sweet and hot peppers come in August; as fall nears, squash and corn ripen. When my husband and I left Manhattan with our little daughter and infant son, we were already plotting the meals we’d cook. But toward the end of the drive, exhaustion kicked in. “Maybe we could eat out tonight?” he suggested hopefully when we entered Kennebunkport and passed the authentically dilapidated-looking Nunan’s Lobster Hut. I contemplated calling ahead and having one of Hidden Pond’s private chefs prepare a clam bake. Arriving at the resort’s stone gates, I was reminded of the private summer colonies that dot the Maine coast—haute-WASP compounds built around the turn of the century, with rusticated Victorian cottages and mossy tennis courts. The cottages at Hidden Pond have retro-quaint names like “Thank You” and “Lazy Days”; ours was called “First Light” because of its eastern-facing porch. We dropped off our bags and had a quick look around—checking out the round wenge-wood dining room table that seats six and the enormous deck that has a wood-framed daybed covered with at least a dozen pillows and views of the pond. Then, overcome with sheer laziness, I took my daughter to the heated pool, lifeguarded by a stone Buddha. One couple read novels on chaise lounges; another lolled on a canopied day bed with their baby. Once guests arrive at Hidden Pond, no one seems to want to move. Kennebunkport buzzes with activity in the summer, making going out to dinner feel like a violation of the “Drive slowly, breathe deeply” sign propped on a birch-branch sawhorse at Hidden Pond’s entrance. Besides, one look at the garden overrode our “Let’s bail on cooking” impulse. We decided to make a version of a recipe by chef Suzanne Goin of Los Angeles’s Lucques: a ricotta, goat cheese and Swiss chard tart. Our kitchen was stocked with almost everything we needed (we’d called ahead with our grocery list), including eggs from a staff member’s own chickens; we picked chard so tender that we didn’t need to remove the red and yellow stems. While the tart baked, we concocted a pine nut–currant relish to spread on top. Afterward, we roasted marshmallows at the fire pit in the middle of the compound (lit every evening at 6:30) and watched, from burl-wood benches, the sun set behind the trees. For breakfast, we relied on the canvas bag hung every morning on a little hook inside our screened-in porch. It held a baguette, blueberry muffins and coffee cake (all baked on the premises), a Thermos of coffee, fresh-squeezed orange juice and the New York Times. We ate on the porch and played Monopoly. I found myself too relaxed to try the daily yoga class at Hidden Pond’s lodge—too relaxed, even, to schedule a massage at the spa tent. In a rare fit of motivation, we took the kids to Goose Rocks beach, just a mile away. Most Maine beaches offer bracingly cold water and barnacle-covered boulders, but Goose Rocks has nearly two miles of soft sand and inlets of warm water. Rather than bring a picnic lunch, we went back to the cottage. We picked baby lettuces, their leaves dappled with maroon, to make the freshest salad I’ve ever had. Then we ate mussels we’d steamed in white wine. For dinner, we’d brought a hanger steak from home; at some point, a Weber gas grill appeared on our porch (the service at Hidden Pond is so invisible that it verges on the supernatural). To go with the steak we made salmoriglio, an Italian herb sauce: We picked oregano from the garden, crushed it with salt in a mortar, and mixed it with lemon juice and olive oil. For a side dish, we fancied up grilled asparagus with a topping of chopped eggs using a half-recalled Thomas Keller recipe for asparagus with egg mimosa. Cooking from memory in an unfamiliar kitchen tested our creativity. For dessert, we’d planned on making a panna cotta with rhubarb compote; I discovered, however, that I’d forgotten to include vanilla extract in my grocery request. So I returned to the garden and clipped some French thyme to replace the vanilla. To my delight, the thyme created a wonderfully aromatic panna cotta that was far more intriguing than the version I’d originally planned. Plus, the challenge of finding the ingredient substitution proved to be strangely gratifying. To lure guests out of their kitchens, Hidden Pond hosts occasional dinners at a long communal table in the garden. Guest chefs like Larry Matthews of the Back Bay Grill in Portland and former Top Chef contestant Sam Talbot, executive chef of the Surf Lodge in Montauk, New York, are invited to prepare menus driven by local ingredients. But I confess that the act of cooking was the agent of our relaxation, not the death of it. Working in the garden helped us speed through our city-decompression period into full-on vacation mode. Bustling around the kitchen, I felt not that I was borrowing someone’s house or life, but that I was, in the most restful sense of the word, at home. Heidi Julavits is the author of three novels, most recently The Uses of Enchantment. She co-founded The Believer magazine.